I took today off, for no particular reason. Because my company doesn’t have sick leave, I usually conserve some of my paid time off in case someone gets sick (or needs surgery, etc.). 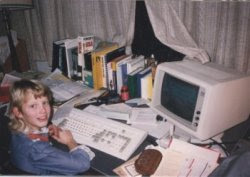 But in the last quarter, if the days are unused, I take some bonus days off to do stuff. 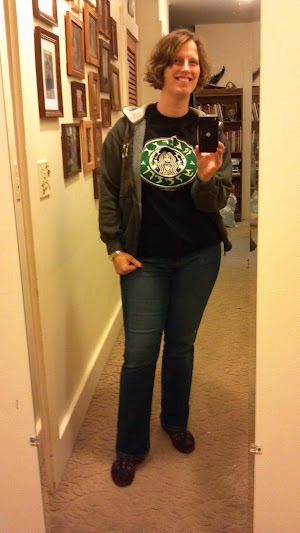 Friday was mostly errands and chores. I got my hair cut, got my eyes checked, did the laundry (partially), had a roofer inspect our roof, dropped the kids off at school and did the grocery shopping. But it so happened that the eye doctor was right next to the Dress Barn. Now I’ve only ever stepped in a Dress Barn once… when I was about 22 years old. I remember thinking that the clothes were all huge and there were not actually that many dresses. I never went back. 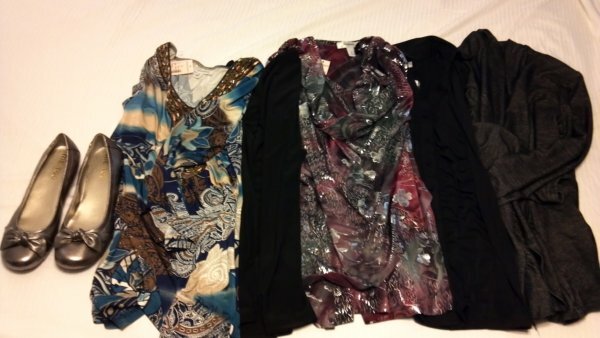 But my mother-in-law has gotten me quite a few Dress Barn things that I liked, and it was right there, and I really needed some new blouses. In my last shopping trip, I picked up two of the bright-colored slacks that are so stylish this year – one plum and one brick red. I was looking for a top that would pick up the plum, to build on what I already had. I spotted this plum and silver foil number and LOVED it. It is a silky knit fabric – very comfortable. 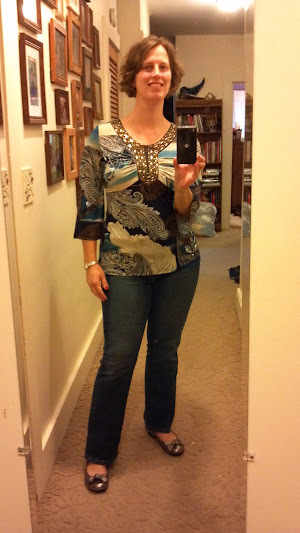 I’m really fond of the foil inlay, which makes this blouse bright and conspicuous. I like a cowl-neck quite a lot. This one is well designed so there are no gaps or unintended cleavage. The sweater that was paired with it is a fabric that looked rather informal on the hanger, and was soft and comfy to the touch. But it got really classy really quickly in this combination. It’s a sweater I can see being a total favorite. It was pretty expensive – the most expensive thing I bought by a good margin – but it is well made and tremendously versatile, making it also one of the most valuable things I bought today. I could see leaving this at work for my “throw on” sweater, for when I inevitably get cold but still want to look good. I probably will not wear a necklace with this outfit – it would be a bad idea to try to compete with that print! 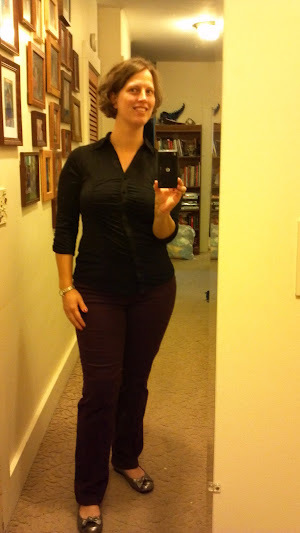 I really like the tailoring, rouching and fabric on this blouse. It darts in nicely at my waist to help give my figure more definition. It’s a great length. The best part is the fabric though – instead of being the stiff cotton that button up shirts usually are, this is a very soft knit. In practice, what this does is to prevent gapping. Now, I’m sure that many of you with two larger lovely ladies up front have some of the same trouble I do – button up blouses are fraught with a revealing peril between the third and fourth buttons. This one, regardless of gesticulation, will stay put. This is a great blouse for either pairing with a really interesting skirt or a really interesting jacket. It’s very versatile (again). The shortened sleeves show off bracelets nicely, although I find it hard to wear bracelets and type all day. Once again: a comfy, stretchy fabric, a basic color, machine washable, nice cut. This is really a shirt intended to be worn under a jacket, when you’ll mostly be noticing the jacket. This was my real extravagance of the trip. The rest are either high-professional or basics. This one is not a basic, and not something I would wear to a client meeting. But it fit really well, and it felt really comfortable. Basically, I failed my will save. I regret nothing. Paired with a brown skirt, it will look a lot dressier than it does here with jeans. That sound you hear is my mother-in-law squealing with delight. Footwear is really the last frontier with me, but I decided I would get one (1) pair of completely non-neutral, exciting shoes this fall and see what I think. Usually, if it’s on my feet, it’s either brown or black. I was looking for a burgundy, but figured a metallic would work too. I really liked these when I saw them (the sole is rubber and looks very durable, the fit was comfortable, there were no heels). You can see how, when paired with the silver and plum shirt, they make a much more interesting statement than just black shoes would. Having those two complementary elements so far away from each other really adds to the “pulled together and stylish” look that I am working to counterfeit. Total damage: Just about $200. Great clothes. Great selection of sizes. Practical (yay machine washable!). But it is expensive. Recommended, especially for people with larger sizes. In order to minimize pocketbook damage, I recommend signing up ahead of time for their coupons, and timing your shopping with their sales. Their standard sale rack was very small, so if you go on your average Friday in September, you’ll likely end up paying full retail price, like I did. I’m a huge Dress Barn fan, thanks to my MIL too! I mainly go for the dresses – I think every shower/grad/etc dress I’ve worn in the last 10 years has been from there. But now you have me thinking I should look for that sweater you got – I desperately need new work sweaters and that sounds like it’d fit the bill. I LOVE that last shirt. They didn’t have a tremendous number of sweaters, but the ones they have are currently on a good sale! Seconded! I had a pair of pewter shoes like that a while back (I wore them into the ground) and you would be surprised how much they can go with. With some things they give a little zing of color and with others they really are a neutral. I concur that metallics are nuetral. But they are not my standard black or brown!!! So pretty! 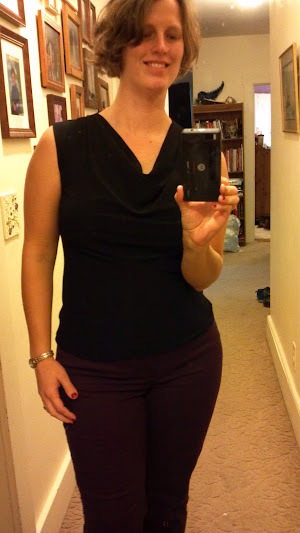 I think I like the plum cowl neck top best. 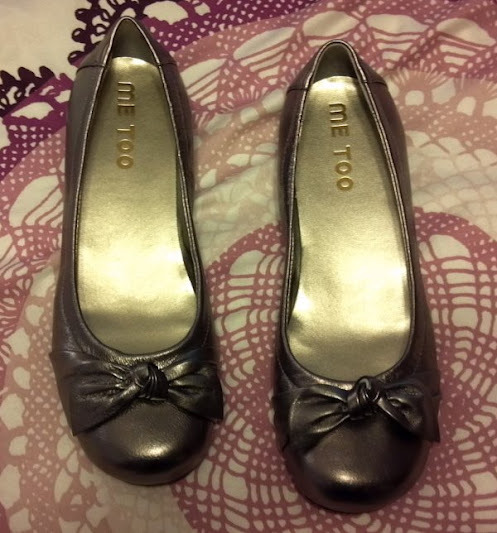 I bought some almost-identical pewter shoes (different bow) this summer, though they prived sadly uncomfortable. Would love to find a good-fitting pair. The haircut looks really great on you, too. That black sweater gets the coveted Librarian Seal of Approval (we know our cardigans)! I’m tempted to go try it on myself, quite honestly. It is a crazy comfy sweater. Gorgeous clothes! 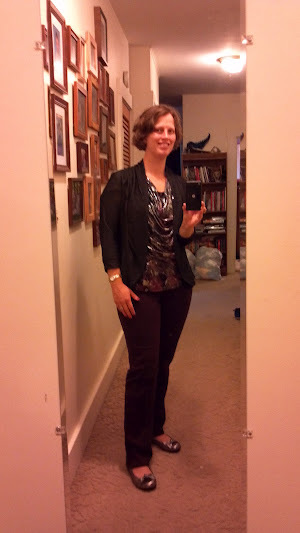 I love the silver blouse, and completely agree that the pewter shoes give you a “pulled-together” look! Dress Barn remains a mystery to me. In terms of footware, try Kohl’s and Burlington Coat Factory (learned from a shopping expedition to match shoes for a wedding).